I came across the work of Ralph Steadman while on an Art Foundation course, for what, at the time, felt like no good reason. I was 19 and very frustrated that the course focused so heavily on fine art, because I desperately wanted to learn skills that would help me gain a career of some sort in the creative world. 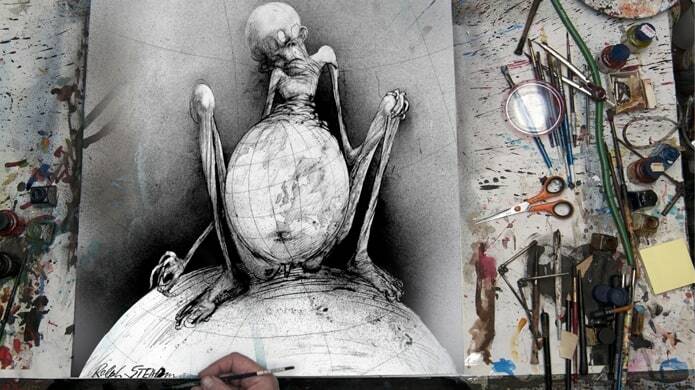 The discovery of Ralph Steadman’s work was a turning point. It was the first time I realised that ‘art’ in its various forms could be used to express views and opinions. And what I created didn’t need to look like anything I’d seen in art history lessons. Time and experience have mellowed me (somewhat) and shown me that this was in fact a good starting point, and the foundation that I still use today. After reading about the documentary film entitled For No Good Reason, I was keen to take a look, and I wasn’t disappointed. It was great to see and hear about Steadman’s creative processes, his inspirations, and how he works. The film also gives an insight into Steadman’s volatile working relationship with Hunter S. Thompson, author of Fear and Loathing in Las Vegas. And of course, there was the obligatory mention of Steadman’s interest in the life and work of Leonardo Da Vinci. At the end of the documentary Johnny Depp says “Ralph, you are an inspiration… for no good reason”. I disagree, I have lots of good reasons to continue to be inspired by Steadman.